"Look, I know the supernatural is something that isn't supposed to happen, but it does happen. " Haunted vessels have recently gained an immense level of popularity among ghost investigators thanks to televised shows such as Ghost Hunters showing investigations on boats and ships that are believed to have a high level of paranormal activity occurring on, around, and throughout them. Stories of wars, treacherous waters, severe weather conditions, and even oceanic anomalies such as those said to occur throughout the region of the world identified as the “Bermuda Triangle” have all contributed to the stories in circulation that directly involve ships and similar types of vessels. In addition to the traditional hauntings that are said to occur on water vessels such as the Queen Mary, the USS Hornet, and The Delta Queen, there are several other stories in circulation about ghost ships. These water vessels are believed to still float among the sea and other types of bodies of water throughout the world. The only issue is, these are not physical water vessels like the Queen Mary, but merely an apparition that occurs to a select few individuals. We here at Greatest Unsolved Mysteries definitely feel as if the mysteries surrounding the ghost ships and the physical ships that are believed to be haunted are some of the most mystifying when it comes to the paranormal field. Ghost hunters have rationalized hauntings that occur on physical ships and apparent ghost ships in many different ways throughout history. Many believe that some event that triggered high emotions such as a frightening storm, a war, or other type of serious complication on the water vessels could have led to unusual paranormal phenomenon. There are other stories in circulation that claim that situations such as extreme weather conditions, sickness, starvation, and a general loss of life onboard a ship could have led to the onset of spiritual activity. Whatever the reason, it is a fact that several ships have been deemed haunted. Here, you will learn about several of these haunted vessels. The mysterious ghost blimp has caught the attention of paranormal enthusiasts since the year of 1942. 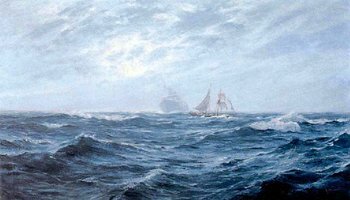 The Mary Celeste is one of the most famous "ghost ships" in maritime history. It is believed that several hundred different individual's souls haunt this water vessel. Throughout this article, you will be introduced to the history of the USS Olympia and the ghostly stories surrounding it.